I am never sure how many people know I have anxiety. I am a class A worrier, dweller, and moment-reliver. Last week was my first full week of graduate classes, and midway through the week, I sat and cried when I got home. Sometimes I wonder what has happened to me. I wasn’t always such an emotional person, but honestly, sitting down and having a good cry is better than bottling up until you explode or internalizing your misery. I am not like most of my family. The idea of working in an office for the rest of my life is repellant even if I do not mind the place I currently work and enjoy the company of the people who work there. I just want more than that. For my entire life, school has been a factor that validated who I was. I was a (mostly) diligent student who got good grades. School has been there to give me a ruler to measure myself against and prove my worth, and this is probably what pulls me toward the world of academia. My family went through the motions of school and seemed to enjoy the social aspects more than anything they actually learned, but because I typically had few friends, my focus was on homework and my classes. In my family, I was first one to go to college for four years and actually earn a degree, and I did it because I loved my classes for the most part and my professors. I had a drive and my mentor nurtured that by giving me the confidence to write more and actually participate in literary conferences when most undergrads didn’t. Toward the end of my time in college, I realized I wanted to be an English professor, but my family has not exactly been supportive of my endeavors. On a regular basis, I am reminded of the importance of money. God, I’m really starting to hate hearing that word. Little jabs and barbs about my never leaving school are said probably once a week. Honestly, I’m tired of it. My choices are held against theirs which were probably made twenty years ago when the world was rather different. When I think about my life and theirs, I take into account that we are different people, yet I feel others do not give me the same benefit. Usually, I can ignore all of this by reminding myself that in the long run I will have a job I like and still be able to keep writing. Last week, I had a meltdown. First week of school anxiety combined with a change in my job schedule and a type A personality led to me sitting in the kitchen arguing with my mom over something that had little to do with what was actually bothering me. With my own family, sometimes I feel it is hard to be myself, but when I am at the university, I am actually taken seriously and valued for my abilities. Family has to at least like me, the people at the school do not, and that gives me a more accurate view of how I am doing. It’s difficult to ignore or hide parts of yourself to avoid conflict, but hopefully there is a place where being yourself isn’t a problem. 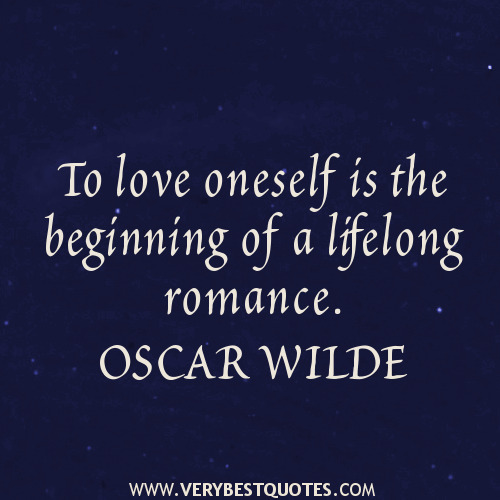 For now, I will follow the advice of my spirit author, Oscar Wilde, and love myself. I am a writer, I am a student, I love learning. These are things about myself that will never change and can never be taken from me. Kudos on being brave enough to follow your dreams and to love yourself for who you are. I’m in a similar boat, as I’m one of the few academic-oriented people in my family. It takes a lot of guts to get out of the office cubicle and into your passions, and I applaud you for moving in that direction. I, too, am stuck in a cubicle from which I hope graduate school will free me. Good luck! I’m still working to escape the cubical, but I think not letting others get you down or manipulate you into not doing what you love. Keep writing =) At least, that’s what I’m trying to do. It keeps the momentum going and gives me hope that it will support me instead of office work.